The British Library, 2014, by Yinka Shonibare. Tate Modern 2019. © Yinka Shonibare. Photograph. Oliver Cowling, Tate. Highlighting the impact of immigration on British culture, The British Library is a site-specific installation with a digital platform for visitors to join in the discussion. Open to the public for free as part of Tate Modern’s collection displays. Tate announced that it has acquired the installation The British Library by Yinka Shonibare CBE, originally commissioned by HOUSE 2014 and Brighton Festival and shown in the Old Reference Library at Brighton Museum and Art Gallery. The British Library is a celebration of the diversity of the British population, containing 6,328 books bound in ‘Dutch wax print’, a fabric characteristically used by the artist in his work. 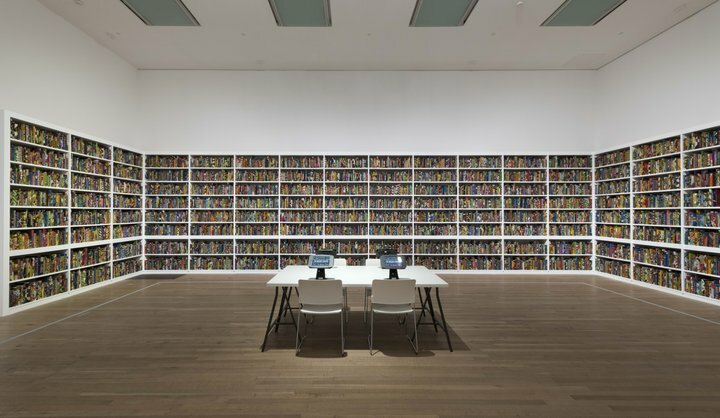 The installation, in which the books are arranged on rows of shelves, also contains an area for audiences to access information about the project on tablets. The work has been purchased with Art Fund support and funds provided by the Tate International Council, the Africa Acquisitions Committee, Wendy Fisher and THE EKARD COLLECTION, 2019. Yinka Shonibare CBE was born, studied and lives in London, but grew up in Lagos, Nigeria. He was awarded the CBE (Commander of the Most Excellent Order of the British Empire) in 2019 and has added the title to his professional name. His dual identity as British-Nigerian has been the starting point for much of his work. Shonibare’s interdisciplinary practice explores issues of cultural identity and colonialism, within the contemporary context of globalisation, and often focusses on the tangled interrelationship between Africa and Europe. Printed in gold leaf on the spines of 2,700 of the books, are the names of first or second generation immigrants to Britain, both celebrated and lesser-known, who have made significant contributions to British culture and history. Among names such as Hans Holbein, Beverley Knight, Dame Helen Mirren and Danny Welbeck are also the names of those who have opposed immigration. Other books are unmarked, suggesting that the story of immigration in Britain is still being written. An important part of the installation is a website, which can be accessed from the tablets in the space. It contains recent materials selected by the artist to present different viewpoints relating to immigration. Visitors can learn more about the people named on the books and access information looking at immigration from different perspectives. They are also invited to submit their own story, and a selection of visitors’ responses will be made available on the website thebritishlibraryinstallation.com. The use of Dutch wax print fabric reveals a complex relationship between colonialism, cultural appropriation and national identity. It was developed in the nineteenth century in the Netherlands as a mass-produced imitation of batiks produced in Indonesia, a Dutch colony at the time. The cheaper, machine-made textiles were poorly received in Indonesia. In West and Central Africa, however, they were quickly adopted and absorbed into local traditions. Opened 25 March 2019 in the Artist and Society display on Level 2 of the Natalie Bell Building, Tate Modern. The British Library was originally co-commissioned in 2014 by HOUSE 2014 and Brighton Festival for the Old Reference Library at the Brighton Museum and Art Gallery. The installation has since been presented at Museu Afro Brasil, São Paulo and Turner Contemporary, Margate in 2016, and was shown as part of the Diaspora Pavilion at the Venice Biennale in 2017. Join artist Yinka Shonibare CBE and curator Ekow Eshun for a conversation around identity politics, a topic the artist has explored throughout his thirty-year career. This event coincides with the display of Shonibare’s The British Library at Tate Modern (from 25 March), an installation which reflects on the impact of immigration on all aspects of British culture, while creating a space for dialogue about national identity, cultural exchange and notions of belonging.